Outside the school building, on the northeast corner of Sam Houston Elementary School, Conroe, Texas. That's where I was when I heard. President Kennedy had been assassinated. Somehow, at just a shade under nine years old, I knew what that big and awful word meant — assassinated: someone had murdered our president. Stunned is the word I would use to characterize the next few days in the Ware household. Glued to the black and white TV in our house at 904 Thomas Street, surrounded by tall pine trees and houses full of kids like me. I do not remember what was said at church that Sunday, but I do know the moment I lost my childhood innocence. It was that afternoon at a friend's house down the street. Coming into Rodney's house, I glanced up at the TV set going in their den. At just that exact moment, Jack Ruby stepped out of the shadows of the underground parking lot and shot Lee Harvey Oswald as he was surrounded by law enforcement officers. I still remember the look of shock and pain on Oswald's face as the bullet crumpled him. 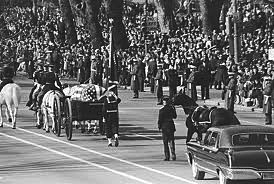 Like the memories of the funeral procession and the salute of John John and the carriage that carried our dead President as his family walked in solemn procession and the riderless horse... this was all on live TV. Live TV was a big deal back then and no one was really ready for what we saw crammed into one week of shock and horror. This was not a show, but real people. So on that Sunday, instead of remembering church, as just a child, I remember a real man, walk up and shoot another despised, but real human being, on national TV. An assassinated president. A murdered suspect. A country in shock and mourning. Innocence obliterated. Such began the long trek to adulthood through the horrors of body counts with pictures from Viet Nam that would mark my generation's journey to adulthood. At the sound of their voices the doorposts and thresholds shook and the temple was filled with smoke. "Woe to me!" I cried. "I am ruined! For I am a man of unclean lips, and I live among a people of unclean lips, and my eyes have seen the King, the LORD Almighty. "Then one of the seraphim flew to me with a live coal in his hand, which he had taken with tongs from the altar. With it he touched my mouth and said, "See, this has touched your lips; your guilt is taken away and your sin atoned for. "Then I heard the voice of the Lord saying, "Whom shall I send? And who will go for us? "And I said, "Here am I. Send me!" (Isaiah 6:1-8 NIV). May God grace us with a renewed vitality to answer his call! Seventy-nine years ago, November 17, 1934, I saw a president of the United States for the first time. My young parents had never seen the president either. Somehow they learned that President Franklin D. Roosevelt, would pass through our small town on his way to visit the Hermitage, home of Andrew Jackson — the "Old Hickory" for whom our town was named. I've been told they bundled me up against the cold and stood on the side of the road to wave at the president. I had been alive for just seventeen months, and President Roosevelt had been in office just twenty. Historian Jon Meacham, in his book American Lion: Andrew Jackson in the White House, tells how Roosevelt refused the ramps constructed at the Hermitage to accommodate his wheelchair and stood, locked the braces on his polio-crippled legs, and painfully walked through Jackson's house to show his esteem for our seventh president. Although the Secret Service will neither confirm nor deny the numbers, many sources report that approximately 3,000 threats against the president's life are received each year. Some sources claim that the threats against President Obama are four times the usual number. Whatever the actual number may be, surely we can agree that any is too many. Even after fifty years, the images are overpowering — my barber shop memories, John-John saluting his father's casket, the muffled drums of the funeral procession, the Zapruder film — images that will never go away. Over all that was the calm voice and visage of Walter Cronkite, his own eyes filled with tears, seeking to make ours go away. It was almost as if the whole people bowed their head! I think George Cornell captured the moment and the hope when he described that day as the day that America, for a time, became a church. In our remembrance, we find hope and encouragement that our nation may never again know such darkness and despair. I was in a barber shop at the corner of N. W. 27th Avenue and N. W. 7th Street in Miami, Florida. The Cuban refugee who cut my hair regularly would never give me any name but Joe, and there was no visible license to identify him otherwise. I insisted that he call me Phillip but he insisted on calling me Father. There was the usual barber shop banter — sports, politics — mostly gossip of the male variety. During lulls in the conversation, the black and white television would blare out a reminder of its presence. Everybody who walked by felt obligated to tweak the rabbit-ears antenna in the hope of getting more than a snow storm. Every time a barber turned his clippers on or off, the TV picture would roll and break up into geometric patterns far more interesting than the soap opera everybody ignored. 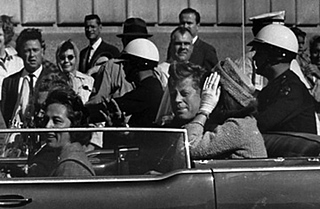 Three shots were fired at President Kennedy's motorcade in downtown Dallas. The first reports say that President Kennedy has been seriously wounded. We just have a report from our correspondent Dan Rather in Dallas, that he has confirmed President Kennedy is dead. I paid Joe for my haircut, and then began to walk a couple of blocks to Kensington Park Elementary School where our oldest son had started first grade a few weeks earlier. We had walked with him the first few days, and then let him walk with friends or by himself. He felt really grown up when he pushed the button that turned the light red and stopped traffic so people could cross the busy street. On this afternoon, I watched as he pushed the button and got halfway across the street before he looked up and saw me. Assuming I had come to walk him home, he began yelling, "What are you doing here? I'm a big boy! I can walk home by myself!" When I told him President Kennedy had been killed, he began asking the why question we still can't answer and the who question some people still think we can't answer. 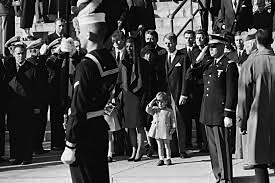 Everyone old enough to remember the assassination of our 35th president has his or her own memory of that day fifty years ago, November 22, 1963. Time seemed to stand still that Friday afternoon. The Thanksgiving sermon I had prepared for the next Sunday no longer seemed appropriate. Many businesses closed. Even Jack Ruby, a man nobody knew on Friday but everybody would know on Sunday, closed his Dallas nightclub. George Cornell, religion writer for the Associated Press, said "It was almost as if the whole people bowed their head and America, for a time, became a church." Other observers said that more Americans attended church that Sunday than on any other day in American history. 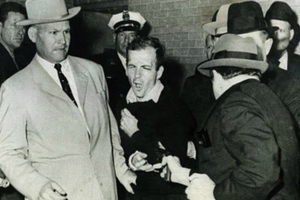 Jack Ruby took matters into his own hands that Sunday when he shot and killed Lee Harvey Oswald, the accused assassin. Other people expressed their outrage in less violent ways. When Dallas businessman and civic leader Stanley Marcus sought to calm his city, he received hundreds of protest letters, many of them containing no-longer-wanted Neiman Marcus credit cards. I reminded my church audience that Sunday that tragedy is a great equalizer, and that evil deeds are often done in the name of righteousness. For the fourth time in our nation's history, all of us joined in mourning the death of a president. Abraham Lincoln was the first, killed by John Wilkes Booth in 1865. Just sixteen years later, in 1881, James A. Garfield was killed by Charles Jules Guiteau. Twenty years later, in 1901, it was William McKinley who was killed by Leon Czolgosz, and now, John Fitzgerald Kennedy. Booth claimed to be punishing a tyrant; Guiteau claimed to be acting "for the good of the country and at the command of God." Please, God, bless America, guard us against such pseudo-patriots, and, without our having to experience such unspeakable tragedy, help America to once again become a church. "50 Years" by Phillip Morrison is licensed under a Creative Commons License. Heartlight encourages you to share this material with others in church bulletins, personal emails, and other non-commercial uses. Please see our Usage Guidelines for more information.